Herge (georges prosper remi) (1907 - 1983), Belgian comic book author. Tintin and Milou, September 27, 1975. Ink on card, 10 x 13 cm. Signed, dated 27.9.75 and autographed. Provenance: original owner, Geneva (Switzerland). 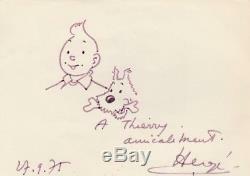 The item "herge drawing tintin et milou original autographed, signed" is on sale since Monday, June 25, 2018. It is in the category "books, comics, magazines \ bd \ boards, original drawings". The seller is "cyril2472" and is located in lyon, rhône-alpes. This item can be delivered anywhere in the world.